Battered and fried. Served with sweet and sour sauce. Fried wrapped chicken, cabbage, carrots, celery, and bean-thread noodles. Served with homemade plum sauce. Fried wrapped I.Crab, cream cheese and cucumber. Served with homemade plum sauce. 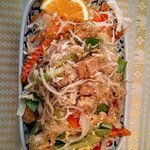 Not fried wrapped i. crab, shrimp, cucumber, bean sprout, basil, scallions, lettuce and rice noodles. Served with sweet chili peanut sauce. Includes scallions, cilantro and fried garlic – vegetarians may ask for no meat. Vegetarians please specify “no egg”; brown sauce is a soy sauce base. Peanut​ sauce over cabbage, zucchini, broccoli and carrots. Onions, red bell peppers, mushrooms, carrots, scallions and celery in a brown sauce. Breaded then sautéed in chili garlic sauce over cabbage, zucchini, broccoli and carrots. Onions,​ red bell peppers, broccoli, carrots, zucchini, mushrooms and snow peas in a chili basil sauce. Onions, red bell peppers, mushrooms and carrots in brown sauce. Onions, red bell peppers, mushrooms, celery, snow peas, carrots and water chestnuts in sweet lime sauce. Onions, red bell peppers, mushrooms, celery, carrots and scallions in chili jam sauce. Onions, red bell peppers, mushrooms, carrots, scallions and celery in curry powder sauce. Onions, red bell peppers, mushrooms, celery and carrots in brown basil sauce. Sauteed in brown garlic over cabbage, zucchini, broccoli and carrots. Egg noodles with eggs, onions, mushrooms, red bell peppers, cabbage, zucchini, snow peas, carrots and bean sprouts in brown sauce. Rice noodles with eggs, bamboo, carrots, red bell peppers, snow peas, mushrooms, celery and onions with a red curry flavor. Rice noodles with eggs and broccoli in brown gravy sauce. Rice noodles with eggs, scallions and bean sprouts in brown peanut sauce. Rice noodles with eggs and broccoli with a tasty soy sauce flavoring. Bean thread noodles with eggs, bamboo, snow peas, onions, carrots, scallions, celery, red bell peppers and bean sprouts in soy flavor. A meat salad enhancing the natural flavors by tossing and turning the ingredients onions, roasted chili, lemon grass, lime leaves, galangal, coriander, scallion, lime juice and fish sauce. Served over a bed of lettuce. Minced chicken with ginger and peanut. Minced chicken with roasted rice flavoring. Sliced tenderloin with roasted rice flavoring. Sliced tenderloin with tomato, cucumbers and roasted rice flavoring. Bean-thread noodles, tomato and peanuts. 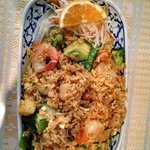 Choice of seafood with tomato, cucumbers and roasted rice flavoring. Fried boneless roasted duck with cucumbers, tomato, cashews and roasted rice flavoring. Snow peas, onions, carrots, broccoli, zucchini and potatoes. Mildest. With mushrooms, water chestnuts, red bell peppers, carrots, onions, potatoes, zucchinis, snow peas and cashews. Bamboo, carrots, zucchini, broccoli, cabbage, snow peas, red bell peppers and basil. Bamboo,​ carrots, zucchini, broccoli, cabbage, snow peas, red bell peppers, basil and pineapple. Peanut flavored. With bamboo, zucchini, broccoli, cabbage, snow peas and red bell peppers. 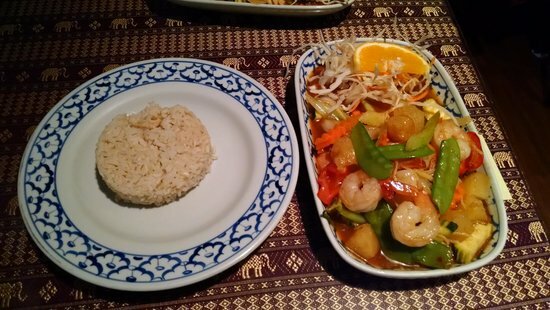 Dishes are prepared on a spice scale from 0-10, thai hot, double thai hot, etc. Everything is made to order, please allow time for preparation. Please inform server of any food allergies or deletions of ingredients when ordering. A gratuity of 18% may be included for parties of 5 or more and for service after business hours. Thai fried donuts served with cream sauce. Sprinkled with peanuts. Exotic fruit chilled on ice. Fried wrapped bananas with honey and sesame seeds. Delicious egg custard with sticky sweet rice topped with sesame seeds. Sweet rice and coconut ice cream topped with honey and peanuts. Coconut ice cream with banana coins on top. Coconut ice cream topped with lychee. Vanilla ice cream wrapped with pound cake, lightly fried, and topped with chocolate and whipped cream. 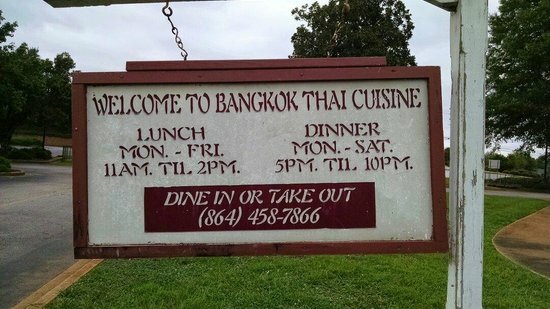 Dit restaurant is nu op haywood rd. Ik ging nooit naar de oude locatie, dus ik weet niet zeker hoe het zich verhoudt, maar deze plek was geweldig. goede service, heerlijk eten, geweldige sfeer. Ik zal vele malen terugkeren. 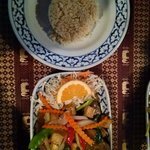 Mijn favoriete Thaise eten dat ik ooit heb gehad! Ze kokos soep is ongelooflijk. Dit is iets dat je echt moet proberen in Greenville. De sfeer is fantastisch en de bediening is vriendelijk en behulpzaam. Love it! Het eten werd geserveerd snel. 4 van ons hadden lunch voor ongeveer $50 met tips. Ik probeerde de Sea food mix met gebakken rijst en het was goed. Volgende keer zou ik gewoon doen garnalen en uitschulping. Over het algemeen zeer goed. 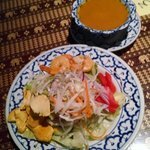 Krijg snel antwoord van medewerkers en voormalige gasten van Bangkok Thai Cuisine.